Regulatory factor X 1 (RFX1) is a member of the regulatory factor X gene family, which encodes transcription factors that contain a highly-conserved winged helix DNA binding domain. RFX1 is structurally related to regulatory factors X2, X3, X4, and X5. It is a transcriptional activator that can bind DNA as a monomer or as a heterodimer with RFX family members X2, X3, and X5, but not with X4. RFX1 binds to the X-boxes of MHC class II genes and is essential for their expression. Also, it can bind to an inverted repeat required for expression of hepatitis B virus genes [provided by RefSeq]. 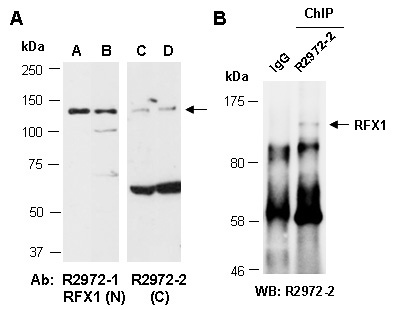 Rabbit polyclonal antibodies were produced by immunizing animals with a GST-fusion protein containing the C-terminal region of human RFX1. Antibodies were purified by affinity purification using immunogen. Fig 1. (A) Western blot of total cell extracts from a,c. human HeLa, b,d. human Jurkat; using 2 independent Abs against 2 distinct regions of human RFX1 at RT for 2 h. (B) Total extracts from human HeLa were immunoprecipitated with IgG or anti-RFX1 (C) (R2972-2) under the cross-linked chromatin immunoprecipitation (ChIP) conditions; followed by WB with the same Ab and Rabbit IgG light chain-specific 2nd antibody.